featuring gothic dolls in my collection. is a 10 1/2 " Takara Bako ( treasure box ) Judy !!! 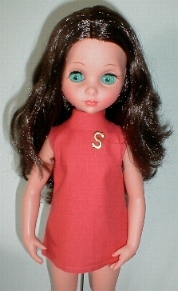 friend doll of Takara Jenny doll. judy had pretty green hair with blue streaks ,lovely side glanceing eyes and in wearing a witch outfit I made for her.